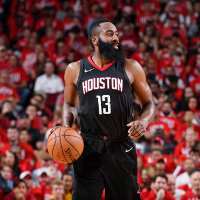 James Harden scored 19 of his 22 points in the second half and the Houston Rockets pulled away to beat the Denver Nuggets 109-99 on Tuesday night at the Pepsi Center. The Rockets won their second straight game after beating the Pacers in Houston 115-103. This victory marked the first time this season the Rockets have won back-to-back games by double digits. Houston, which had an NBA-high 65 wins last season, has won five of seven games since a 1-5 start. Denver, on the other hand, is heading in the opposite direction as the defeat sent them to a fourth straight loss and their first one by double digits this season. Harden also had 11 assists, with several going to Clint Capela, who led the Rockets with 24 points, including a series of dunks. Chris Paul added 21 points for Houston, playing a third straight game without Carmelo Anthony because of what the team said was an illness. Monte Morris had 19 points for the Nuggets, who have lost their last eight meetings with Houston. Gary Harris and Jamal Murray added 15 points apiece. A step-back shot by Murray got Denver within four points midway through the fourth quarter but Harden went on a tear, scoring 11 straight Houston points to put the Rockets up 104-91 with 3:48 remaining. The Nuggets closed the gap to six points in the waning moments, but the Rockets got a couple of free throws from Paul and a dunk from Capela to hold on. Down by a point at the break, the Rockets opened up an 86-76 lead going into the final quarter. After a pair of free throws by Paul Millsap pulled Denver to 74-72, the Rockets closed the third period on a 12-4 run capped by Eric Gordon’s driving layup. Murray hit a jumper in the final seconds of the second quarter to give the Nuggets a 55-54 halftime lead. Both teams resume activities on Thursday night, with the Rockets hosting the Golden State Warriors, and the Nuggets hosting the Atlanta Hawks.